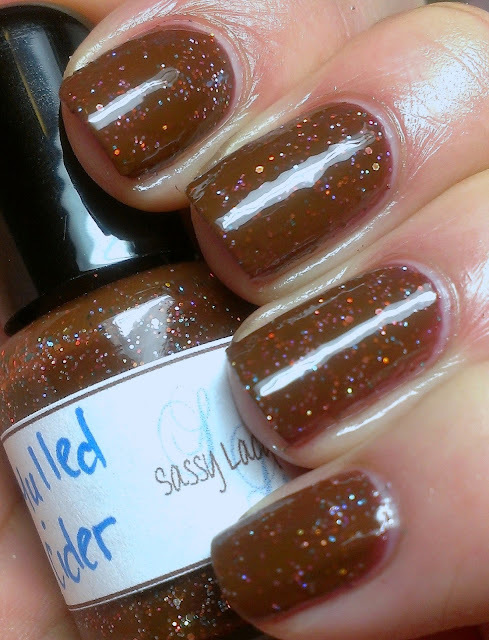 I have a gorgeous fall polish to share with you guys from Sassy Lacquer. Sassy Lacquer was created and is ran by the talented Carrie, she makes some pretty cute and unique polishes inspired by seasons or just just a random themes. Each polish is indivially mixed so keep in mind that versions may vary slightly. All her polishes are 3-Free!!! She also makes custom polishes, if you have anything in mind she can create it for you. Contact details are shown below. 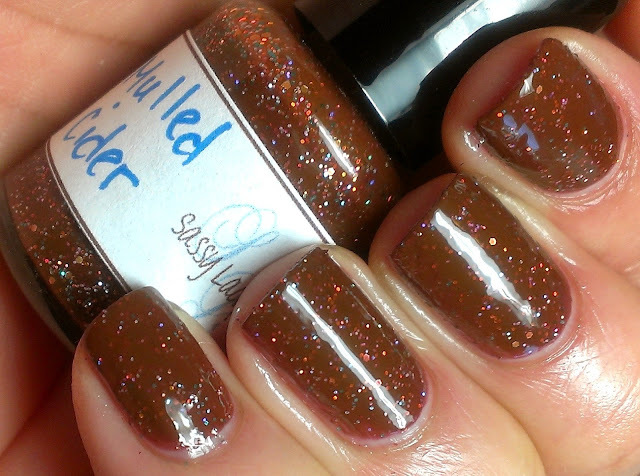 This one is part of her Fall Collection, Mulled Cider "is a brown/orange with a slight purple hue to it, creme. It has micro fine gold and silver holographic glitter, and teal micro fine glitter. Pictures really do not capture the unique beauty of this polish"
Now I want a cinnamon donut and some cider :-) I love the sparkle in this polish! That is a very interesting and unique polish, thanks for sharing! Love, love, love this! It just suits you so well, Iris! This is a super gorgeous color! Ooh this is pretty! Love the color! wow that's a unique polish! never seen something like this! This is gorgeous! It is so different! I love it! This screams fall and I love it! This makes me realize how badly I need a good chocolate colored nail polish. The only one I own is by Sinful Colors, not very pretty in my opinion. But I really like this cider polish.